Qodshanes, the historically famous mountain village with the former residence of the Assyrian patriarch Mar Shimun, is situated to the north of Hakkari town in SE Turkey. It is a magnificent site on a fertile plateau surrounded by high mountain peaks. 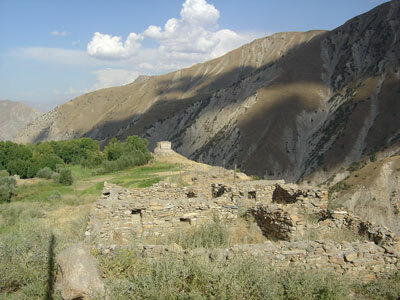 Even today there is only a dirt road, a narrow track, leading to Qodshanes and the remote site cannot be visited without permission from the authorites in the city hall of Hakkari town. 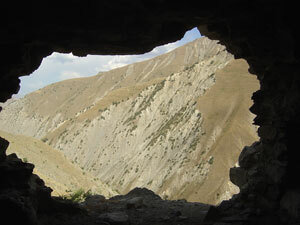 There is however another way to get there - with a bit of luck and a little help from a friend, a local Kurdish guide. That man came from New Qodshanes or Konak, the Kurdish village in the mountains, a few miles from the old Assyrian site. 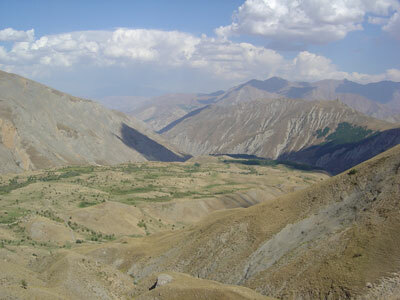 We drove from the poor Kurdish outskirts of Hakkari town, following the long and winding sandy track that climbed to an altitude of approximately 2.000 metres. It took us a couple of hours. And there it was at last - the Qodshanes plateau, the Nestorian Vatican of the Assyrian tribes, Mar Shimun's Christian citadel, separated from the outside world by rugged mountain tops and steep precipices. Old Qodshanes, once the renowned dwelling place of the Assyrian patriarch , is now completely in ruins. There is just one Kurdish guardian living nearby. He is supposed to look after the site and see to it that what is left of it doesn't get demolished or carried away to serve as building material elsewhere. Patriarch Mar Shimun's residence has been razed to ground level and one or two artificial slopes indicate the spot where the Assyrian burial grounds must have been. There are no tombstones left. I just found a couple of stone slabs. They must once have covered Assyrian graves, but now they are used as small bridges over a brook. There is plenty of water on the plateau and all kinds of crops are grown in the fields close to the Assyrian ruins. Weeds and wild flowers amid the old stones, the dark shadows of white clouds drifting in the blue sky above the plateau, the deep silence of the past all around. Eski Qodshanes on a golden afternoon, late summer of 2007. 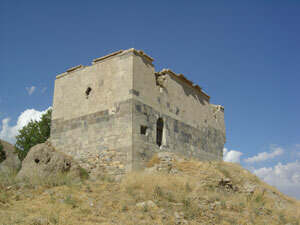 Mar Shalita was the main church of the Assyrian Patriarchate at Old Qodshanes. According to the British Reverend W.A. 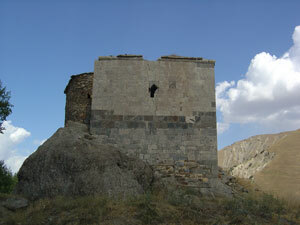 Wigram, who visited the Assyrian patriarch Mar Shimun in the beginning of the 20th century before the First World War, the Mar Shalita church was a simple stone building. Small in size, it more resembled a border watchtower than a Christian House of Prayer. The interior of this Nestorian church was dark and narrow and there was no decoration at all. No paintings on the walls, no figures or statues of saints, just curtains and bunches of aromatic herbs suspended from the wooden tie beams. Thus the Assyrian patriarch wanted to stick to the age-old, pure Christian creed and avoid any reproach of idolatry from his Muslim neighbours. Nowadays the Mar Shalita church has been partially restored, at least from the outside. Its interior is still a mess. The floor is completely broken up, with deep holes in it, probably due to the digging of treasure hunters from Hakkari or elsewhere. Furthermore the sanctuary has been seriously damaged and where once the altar stone with the Holy Cross stood, there is now a big hole in the exterior wall. Fund raising for the restoration of Mar Shalita must have been the good work of the Assyrian community in the diaspora: USA, Australia, Europe. Patriarch Mar Shimun was murdered at the end of the First World War. What was the fate of the people of Qodshanes? Together with the whole Assyrian nation they fled from Hakkari and Ottoman Turkey and they resettled in the northern part of Iraq under British protection. But the problems with Kurds and Arabs went on and Qodshanes people eventually found a relatively safe home in the Al-Hasaka region on the Khabur river in Syria. Till today about 35 Christian villages create an Assyrian enclave in that Syrian desert plain. One of these tiny settlements is called Tell Hafian. Its present inhabitants are the descendants of the Assyrian refugees from Qodshanes. There is a church in Tell Hafian - it is called Mar Shalita. It was late summer 1915. Turkish troops and Kurdish irregulars had sacked and destroyed Qodshanes. The whole Assyrian nation, the mountaineers with their families, was on the run, driven away by heavy Turkish gunfire from their last stand in the Hakkari mountains. Patriarch Mar Shimun marched with one of the columns. The route led over a lofty mountain col from where he caught a glimpse of the plateau of Qodshanes. Mar Shimun stood there and gazed. The last sigh of the patriarch. He said: 'When shall I ever drink the water of my green Qodshanes again?' It was heard by some Assyrian warriors close to him. They broke away from the line of march, they fought all the way against Kurdish enemies who tried to stop them, and they came back with a can of Qodshanes water for their beloved Mar Shimun. A moving tale, told by Reverend Wigram in his book The Cradle of Mankind (1922) about the Assyrian nation. Reality was less romantic. Three years later Mar Shimun was shot and his Assyrian people - the Turks called them traitors, since Mar Shimun had declared war on Ottoman Turkey in 1915 - was never allowed to return to the native villages in the Hakkari mountains. Nowadays Qodshanes water makes Kurdish crops grow.